We were eating last week at Asian Alley, a narrow eatery among the row of restaurants along ByWard Market Square, where, for starters, the funky, new-generation ambience sets it apart from Chinatown’s myriad and more traditional soup shops. The 40-seat restaurant, which opened in August 2014, is sandwiched between a long wall painted with a graffiti-style, video-game-themed mural, and a large blackboard that re-lists the two-page menu’s choices. Underfoot is a floor made with thousands of preserved pennies, and behind the open kitchen are washrooms that are conversation-piece quirky. Adele’s playing on the sound system, not Vietnamese pop. Backless wooden seats and banquettes would be harder on bonier derrières if service here weren’t so fast. But back to the pho. Asian Alley’s soups are more limited in number than what a full-on pho shop offers. The restaurant’s Facebook page and website mention that organic beef and chicken are used in dishes when possible. Also, the pho can cost a few dollars more here, although fortunately, the most expensive, signature soups are worth savouring. Quite satisfying was Asian Alley’s rendition of bun cha ca ($13.95), the chicken-broth based soup with thin rice noodles and slippery, spongy slices of deep-fried fish-and-shrimp patties. Equally good was the beefy special pho of thicker rice noodles and tender braised veal ($15.95). Its broth was winningly complex, with a strong star anise note, and my friend appreciated the optional and very much “downtown” fried egg that he ordered. On another visit, a vegan friend tried the vegan pho ($10.50/$12), which turned out not to be a contradiction in terms. Its broth relied on a mushroom-based mix that we were told could be purchased in Chinatown. I’ve tried that standard-issue beef pho ($10.50/$12), and prefer the razzle-dazzle of the premium soups. For one thing, the thinly sliced beef was not only well done to the point of toughness, but also flavour-deprived. Like many an Asian restaurant, this one swaps its proteins into various dishes. The braised veal, for example, is available on rice too, or with stir-fried rice noodles or fried rice. To my taste buds, the most interesting of the meat options was beef rendang, a spicy Indonesian preparation with intense slow-cooked flavour that’s too infrequently seen in Ottawa. 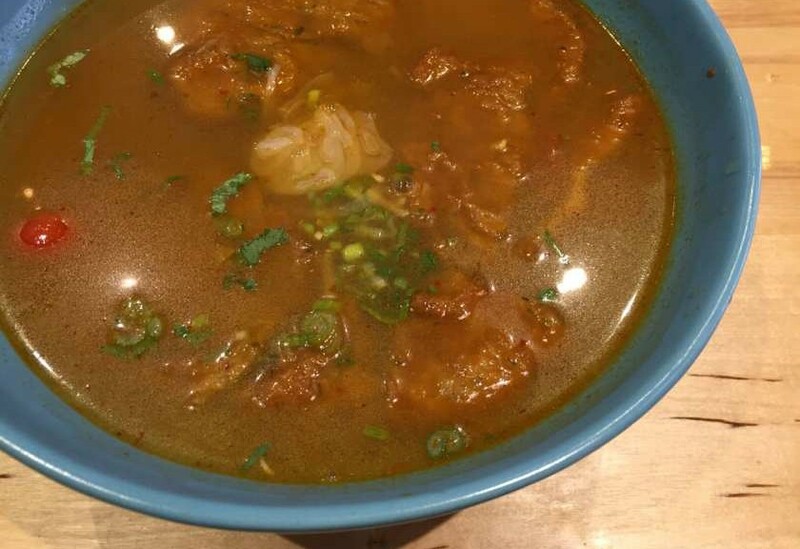 The rendang did a fine job of enlivening a dish of chow fun rice noodles ($15.95). While it looked like casual, short-order, somewhat greasy stuff, the noodles were the lip-tingling satisfaction that the spice-hound at our table was craving. Even if every other dish at Asian Alley didn’t appeal, I’d return just to try the rendang, perhaps in fried rice or in a sandwich. Of the appetizers, pork potstickers ($10.95 for five) were winners, packed with a pork filling made punchy with lemongrass and nicely seared. We only wished they were a little less pricey, and that their sauce was more special than from-the-bottle hoisin. A rice wrap ($4.45 for one) disappointed with flavourless shrimp. Chicken pad thai ($13.95), taken home and sampled, lacked the vibrant flavours that make better versions of the ubiquitous noodle dish worth getting excited about. More on the mark was the shrimp fried rice ($14.95). Asian Alley is licensed, with several Beau’s and Bicycle Craft beers among the choices. There are no desserts currently available, although the online menu lists a few. Now, a server might direct you and your sweet tooth to the Cupcake Lounge next door. Servers have always been prompt and enthusiastic, and they’ve ranged from completely in-the-know to very much neophyte. Other Facebook posts show more dishes that I’ve not seen available at Asian Alley when I’ve visited, including bao buns and laksa, the spicy Chinese-Malay soup. Given what I’ve enjoyed most, I’m hoping for greater ambitions along these lines from Asian Alley.